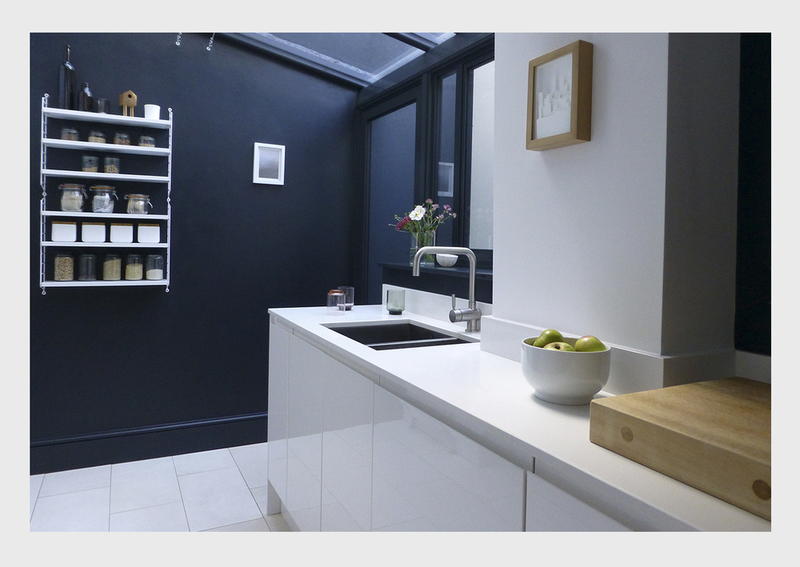 A renovation returning this Brighton property from flats to a town house. The brief from the owners was to create bright, simple living spaces within a mid range budget. A glazed extension was added to the rear ground floor creating a new light filled kitchen area and provide access and views to the rear terraced garden from the open plan lounge and dining area. A new stair balustrade was installed from ground floor up to second floor and existing floorboards were painted throughout to create a uniform flow. The main bathroom fittings were retained but a new decorative colour scheme was introduced. Rooms were styled with an eclectic mix of designer, high street and vintage furniture and lighting. A painted colour palette of bright white, soft stone and dramatic greys was selected to provide a base for the vibrant patterns, textures and colours of the artwork and furnishings.